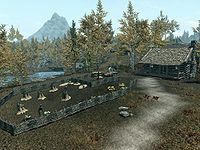 Merryfair Farm is a poor, small farm west of Riften, owned and run by Dravin Llanith and his wife Synda Llanith. The farm is located just west of Riften Stables, on the north shore of Lake Honrich in the Rift. * This can be used to produce flourHF from wheat if Hearthfire is installed. The couple make a poor living growing bushels of wheat, cabbages and gourds. Their cow provides them with a fresh supply of milk and Dravin can often be seen milling wheat for their bread. Speaking to Dravin reveals that there was a recent break-in at the farm. Among the items that were stolen was Dravin's bow. He believes the Thieves Guild was behind the burglary and that they stashed his bow somewhere in the Ratway beneath Riften. This gives you an opportunity to accept retrieving it as a quest. Once you complete the quest you will be able to freely take most of the items from the farm. The front door is normally novice locked. Upon entering there is a wall shelf immediately on your left holding a pile of clutter and a bottle of wine. There is a doorway to the right of the shelf in the west wall. There is a crate with a couple of food sacks against the north wall with a bottle of wine on the crate, next to a chair that is pulled up close to the fireplace. The fireplace is in the east wall and has a cooking pot in front of it. To the right is a set of shelves holding a few potatoes, a cabbage, two loaves of bread and several pieces of cheese. Against the south wall is a small square wooden table and two chairs, with a bottle of wine, a cabbage, a loaf of bread and an eidar cheese wedge on the table. The doorway to the west leads to the top of stairs leading down to the cellar; there are barrels, sacks and a crate at the top of the stairs. Descending the stairs to the south brings you to a storage area with a pile of firewood and a couple of straw bales under the stairs and several crates and barrels along the north wall and in the northeastern corner. To the east is a doorway that leads into a large bedroom with a king-sized bed with an end table to the right of it and a crate in the northeastern corner. Against the east wall is a tall wardrobe containing clothes and a chair in the southeastern corner. 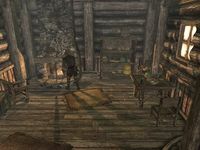 There is a medium coin purse under the left side of the bed and a dresser against the west wall with copies of A Gentleman's Guide to Whiterun, Wabbajack, Olaf and the Dragon, The Woodcutter's Wife and The City of Stone. This page was last modified on 13 April 2019, at 16:36.